Sometimes a small difference in writing a character may have a big impact on its recognition. 采 is composed of 7 strokes. Its associative compound is a hand 爫 plucking fruits from a tree 木. 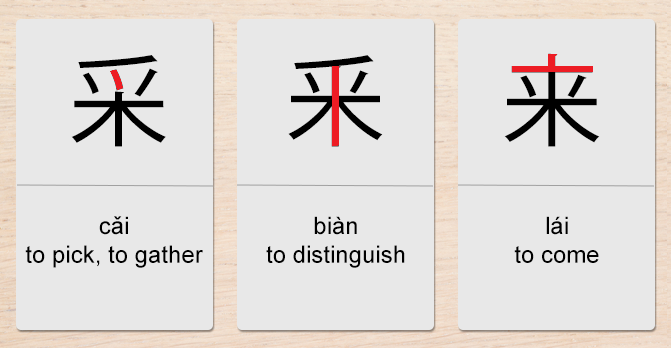 釆 is composed of 禾 and 丷. The ancient written form of 来 looks like a wheat cone. Ancient Chinese people believed that in autumn wheat was carried and spread by birds so that it could be harvested next year. 来 also means "arrival". The vertical stroke in the middle goes across the top and lower horizontal strokes.